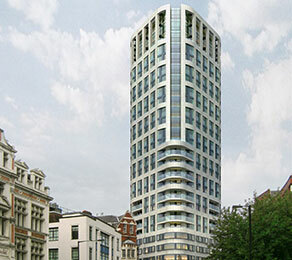 CCL is designing, detailing, supplying and installing CCL’s new flat-slab bonded post-tensioning system for Eagle House. A 1930s listed building, Eagle house will be transformed over the next three years into a modern high-rise building with 287 apartments and penthouses of which 70 will be affordable housing. The building also includes 4500 m2 of retail units, offices, start-up business units, a supermarket and a health and fitness suite along with a basement underground car park. At street level, retail outlets with large frontages will face directly onto the surrounding streets. CCL post-tensioning will be used at all floors from level 1 through to 26 of the new tower and commercial areas. More than 100 tonnes of high tensile strength cable will be installed in total, including approximately 3000 anchors, 10,000 wedges and 50,000 m of ducting. CCL was awarded the project because of our ability to develop unique solutions that deliver outstanding results. For Eagle House we created a completely new bespoke system that combined a traditional solution with beams to a flat-slab post-tensioning solution. The development objective is to achieve a flat soffit within the tight floor-to-floor heights while maintaining a minimal floor thickness. The use of post-tensioned slabs allows the structure to maintain a minimal slab thickness of 225 mm throughout. CCL post-tensioning creates increased deflection control, which allows for the removal of the previously required downstand beams around the edge of the tower. Post-tensioning dramatically reduces the cost of the formwork and increases the speed of construction.